German lexicographer; born in Altstrelitz, Mecklenburg, April 12, 1819; died March 12, 1897. He received his early education in the Jewish school of his native city, under I. Lehfeldt (later a partner of his brother-in-law, Moritz Veit, the founder of the celebrated book-firm in Berlin) and Joseph Zedner (afterward librarian in the British Museum, London). He then attended the gymnasium in Neu-Strelitz, took private lessons in Greek and Latin, and afterward went to the universities of Berlin and Halle, studying classical and modern languages, mathematics, and natural history. In Berlin he made the acquaintance of Moritz Carrière and Heinrich Bernhard Oppenheim, two men of great intellectual capacity, with whom he entered into a close friendship. Having graduated as doctor in 1843, he was appointed principal in the same school in which he had been trained in his native city. He held this position for ten years, until the school, which was a private institution, was closed. Of his numerous works relative to the lexicography and grammar of the German language the following deserve special mention: "Katechismus der Deutschen Orthographie "(Leipsic, 1856; 4th ed. 1878); "Handwörterbuch der Deutschen Sprache" (ib. 1859-65; 5th ed. 1893; this was his chief work, and was inspired by the German dictionary of the brothers Grimm, which he criticized sharply); "Fremdwörterbuch" (ib. 1871, 2 vols. ; 2d ed. 1891); "Wörterbuch der Deutschen Synonymen" (Hamburg, 1871; 2d ed. 1882); "Deutsche Sprachbriefe" (Berlin, 1878; 11th ed. 1894); "Lehrbuch der Deutschen Sprache für Schulen in 3 Stufen" (8th ed., Berlin, 1888); "Geschichte der Deutschen Sprache und Litteratur" (3d ed., ib. 1886); "Abriss der Deutschen Silbenmessung und Verskunst" (ib. 1881; 2d ed. 1891); "Leitfaden zur Grundlage der Deutschen Grammatik" (2d ed., Weimar, 1894). Besides he published "Das Volksleben der Neugriechen" (Mannheim, 1844); "Das Hohelied Salomonis" (Leipsic, 1866; new edition, Hamburg, 1888); "Heitere Kinderwelt" (Neu-Strelitz, 1868); "Aus den Besten Lebensstunden: Gedichte" (Stuttgart, 1878); "Aus der Werkstatt eines Wörterbuchschreibers: Plaudereien" (Berlin, 1889); "366 Sprüche" (Leipsic, 1892); and a "Neugriechische Grammatik" (after Vincent and Dickson, ib. 1881; 2d ed. 1890), and together with A. R. Rangabé (n.d.) a "Geschichte der Neugriechischen Litteratur" (ib. 1884). In 1860 he translated into German the Song of Solomon, which was republished in 1880. 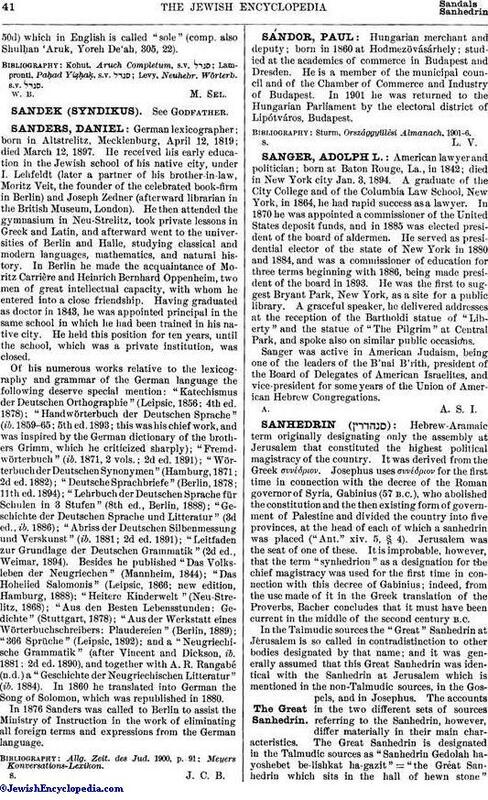 In 1876 Sanders was called to Berlin to assist the Ministry of Instruction in the work of eliminating all foreign terms and expressions from the German language.